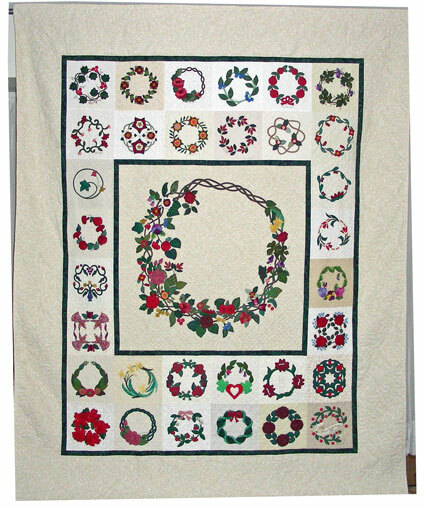 The Saga of the "Wreath Quilt"
The year was 1997, the first year that Polly Mello was president. BAS was broke. It was difficult to fulfill the purpose that had been established in 1993--"to support efforts to preserve Textile Collections." Ann Christy as chair person of Programs suggested that a wreath quilt be created to raise money. Support for the BAS was strong and many energetic members wanted to make a block for a raffle quilt. To keep things simple the request was placed in the newsletter for members to make a wreath block of their own design on a light background. Within six months, in 1998, blocks began to pour in. Members also sent extra fabric that could be used for the center block. When all the blocks were turned in Chris Miller designed the center wreath using the elements from all the individual wreaths. Anita Askins appliquéd the center block and pieced the blocks together. The top was finished. But the big job of quilting remained. That job was given to Ann Christy. Since BAS really had no money, Ann bought the batting and backing herself, as well as five large spools of thread. The quilt is 108" wide. And the quilting began. When I first saw the wreath quilt in October of this year, it took my breath away. Of course the colors are bright and the flowers are beautiful and the work is fine, but it was the signatures that made me feel "tinglely." I hope you know what I mean by that kind of feeling. Here were thirty-two blocks, stitched by women who cared about the Baltimore Appliqué Society from different places of the United States and the world. Here is the whole story of the Baltimore Album. A collection of different forms, different levels of skill, all volunteers, all working together to create a beautiful quilt for a cause. It is indeed Baltimore Appliqué Society's Album quilt. Having joined the Baltimore Appliqué Society in 2001, I do not recognize many of the names. Some women have died, some are off our current record, some have moved on to different places and different interests. Chris Miller, where are you? What a creative center design that incorporates something from each wreath, from Geckos to blueberries to a Ruched rose. But we have their work. And the work represents a community--the reason why I got a bit breathless when I first saw the quilt. And I believe the same feeling comes from all the beautiful antique Baltimore Albums that were made by many people, mostly women, joining in a common goal. In a fractured world that feeling of community must be celebrated and upheld. We celebrate this community by giving the names of the women who create this quilt. Ann Christy was given many different deadlines for finishing the quilting of the "Wreath Quilt." Having met the final deadline, she handed the quilt to Margo Cramer who completed the binding and washed it. The quilt was awarded to the lucky raffle winner in June 2012. Contributors: A1. Marylou McDonald, Grapevine; B1. Jane McCabe, Four petal flower wreath; C1. Anita Askins, Rose wreath with interlaced vine; D1. Ellie Layman, Blueberry wreath; E1. Eleanor Turner, Pomegranate wreath; F1.Chris Miller, Grapevine; A2. Jan Carlson, Five large and small red flowers; B2. Fiona Gray, Tudor Rose; C2. Judith Thompson, Print flower wreath; D2. Mary Stewart, Spring leaves; E2. Ann Christy, Three flower wreath; F2. Grace John, Cherry wreath; A3. Susan Hinzman, Ivy wreath; F3. Kay Smith, Rosebud; A4. Pamela Budesheim, Morning Glories; F4. Della LeConte, Swirling Tulips; A5. Kathy Siuta, Vase and flowers; F5. Joyce Wilson, Pansies; A6. Robbyn Robinson, Surrounded by angels; F6. Joy Nichols, Red Roses and small blue flowers; A7. Kelly Meanix, Hollyhocks; B7. Marian Price, Daffodils; C7. Linda Tonyes, Anthrus, Geckos and Swallowtail butterflies; D7. Barbara Pearson, I love Ireland; E7. Rita Gallent, Red and green wreath; F7. Rita Ruszezyk, Paper cut wreath; A8. Diane Gates, Hibicus wreath; B8. Carol W. Mesimeo, Rose and rose buds; C8. Berta Murray, Strawberries and leaves; D8. Polly Mello, ribbon wreath; E8. Emily Koon, Ruched rose; F8. Barbara Burnham, Cherry wreath with banner.